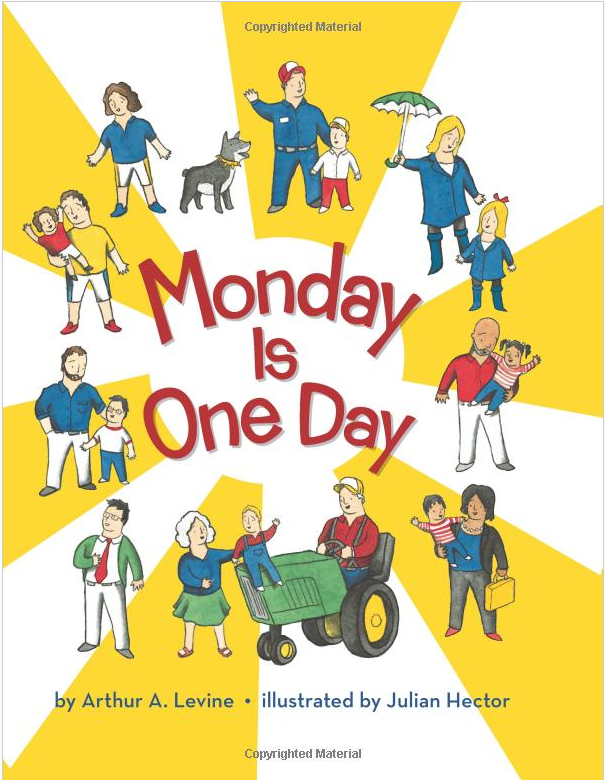 Last night my editor, Arthur Levine, stopped by Seattle's very own Secret Garden Books to tell us all about his new picture book, MONDAY IS ONE DAY, a sweet poem about the angst working parents feel leaving their children at home--as well as the many lovely moments during the week they share with their kids despite that. Security was tight at Scholastic during the blazing-fast editing of the later books. All the windows in Arthur's office were covered so no one could peek in--and he couldn't see out. There's a backwards spell in some copies of one of the middle books. Apparently a zillion people noticed and let them know. Some people are so Hermione. There are more details, of course. But I wouldn't want to get Arthur into too much trouble (kidding!). He read the book to us and shared a funny anecdote about the illustrations on one page. The text refers to "three raspberries on three noses" (or something close to that). The superb illustrator, Julian Hector, doesn't have children and doesn't have first-hand experience at blowing one on a child's wee body--so he drew raspberries on the characters' noses. My inner Ron Weasley wishes they'd left it this way. Anyway, it's a good reminder to attend book events at local stores. You learn all sorts of things you'd otherwise have no way of knowing. I sure do appreciate what people at Secret Garden, Queen Anne Books, Parkplace Books, Third Place Books, and University Bookstore (among others) do.